Last friday, Baihana had the honor of performing at the Tokyo-Manila Jazz & Arts festival opening concert which was held at the RCBC Plaza in Makati. We were extremely nervous and excited for two reasons: We knew the theatre would be filled with Jazz enthusiasts, so we had to step it up. And the artists we were sharing the stage with were AMAZING. Words aren't enough to describe how blown away i was by both the Filipino and Japanese Jazz musicians. The line-up included the PYSB (Philippine Youth Symphonic Band), Baihana, the ETS Septet led by Elhmir Saison, Isabella Gonzales, Nicole and Carlo David, Mon David, Charito, Tetsuro Kawashima, Yuki Arimasa, Kengo Nakamura and Andrew Dickeson. The night was hosted by singer-actress Cris Villonco. Our set list for the night included "Usted Abuso", which the organizers requested us to play because of the festival's theme of Latin Jazz Music. We then did our version of "Donna Lee" with Tagalog lyrics written by Krina Cayabyab, and ended our spot with our take on the Real group's "Count Basie medley". I was unbelievably nervous, but had the greatest time singing once we got settled on stage and felt the audience's support. The good thing about being the second group to perform was that we were able watch the rest of the performers afterwards. My ears, heart and soul were filled with wonderful music from the beginning of the sound check until the final song of the concert. The PYSB opened the show, so i didn't get to catch them during the concert proper, but was lucky to have heard them during sound check. I always look forward to hearing them perform because i am so amazed at how passionate these talented kids are. It was my first time to watch the ETS Septet which was led by Elhmir Saison, joined by Colby Dela Calzada on Bass, Mar Dizon on drums, Michael Guevarra on Tenor Saxophone, Price Edward Picache on Alto Saxophone, Jose Aris Antinero on Trombone, and Robert de Pano on Trumpet. They were also joined by Uly Avante on percussion. Their originals were wonderful and the whole group's performance was completely energizing and inspiring, as you would expect from musicians who have made their mark in the Filipino music industry. The PYSB. Photo by Moy Ortiz. Isabella Gonzales. Photo by Moy Ortiz. Mon David started singing and WOW. Just. WOW. He was completely in his element, scatting and singing so flawlessly. I was floored. He started with a number that was so challenging and entertaining that left everyone in awe. He then did a song with Japanese bass player Kengo Nakamura, a number that easily became one of my favorites of the night. Nicole and Carlo joined him for a song, and you would be easily led to saying how they got their talent from their father, but watching them do their own thing makes you see how unique they are individually. They both delivered such beautiful tones and notes and runs that made the whole performance so incredible. Mon David. Photo by Moy Ortiz. Nicole, Mon and Carlo David. Photo by Moy Ortiz. 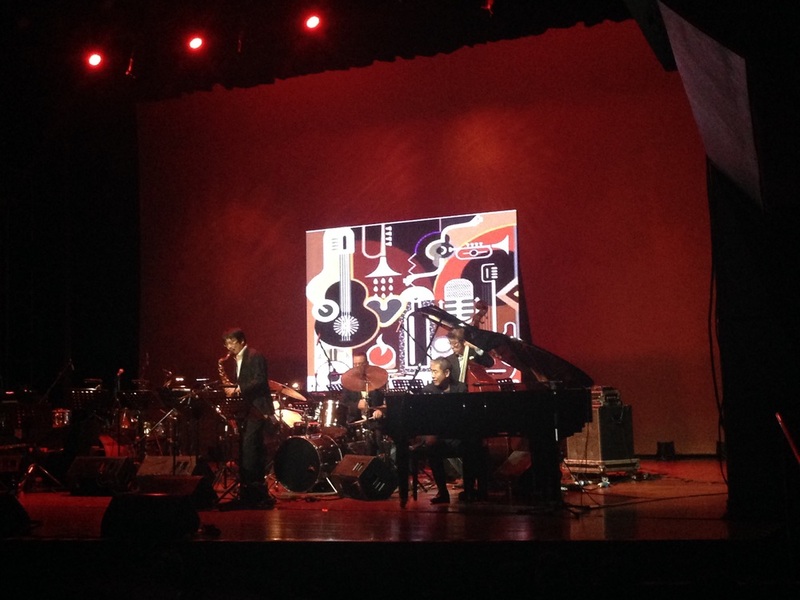 Tetsuro Kawashima, Yuki Arimasa, Andrew Dickeson and Kengo Nakamura brought the "Tokyo" to the Tokyo-Manila Jazz & Arts Festival, and what a treat that was! They we're playing together so harmoniously but you could also hear each one of them play so prolific in a way that it didn't confuse or overwhelm your ears. It was so beautiful and tasteful and just absolutely inspiring. Just when you thought things couldn't get any better, Charito joined them, and it was magical. Their collaboration sounded like they'd been playing those songs together for years, and yet they only rehearsed together that day. How is that even possible? If you close your eyes, you'd think that you were listening to a record. Her voice and the music was absolutely flawless. I was completely in love. It was beautiful and crazy in the best way. The musical genius, talent, improvisation and collaboration that I witnessed in that theatre that night was absolutely, for the lack of a better word, INSANE. I keep saying this, but just because I can't stress it enough, everything was just so incredibly beautiful. I feel so lucky to have been given the chance to perform that night, but even luckier to have watched all the other artists. I learned so much and was left inspired and hopeful for the jazz scene in the Philippines. I really pray that the support will remain and grow, and that more musicians will create more wonderful music. Finale number with all the participants. Photo by Moy Ortiz. If you don't have any plans, catch the last concert later tonight at the Ayala Greenbelt 5 Mall. It's free! Show starts at 8:00pm. Trust me, you wouldn't want to miss this! Thank you again to Charito, Moy Ortiz, Miss Maja and the whole organizing team for giving us the opportunity to perform alongside all the talented musicians. Looking forward to many more years of this Jazz festival here in Manila! Like most of you, I'm someone with many wants, dreams, and a long and growing bucket list. I'd like to believe that I have enough gusto to move forward, enough talent to showcase, and enough creativity to make me unique. The goal is not necessarily to stand out, but to be interesting enough for people to "give me a shot." I am a wife and a mother, two of the most fulfilling roles ever. I like doing arts and crafts and spend a decent amount of time on Pinterest, or creating things I hope are Pinterest-worthy. I love to travel and am lucky that I get to travel because of work! I fell in love with baking in 2013, the year I decided to first try baking macarons. This story is what I want to write about next because it is such an important story to me. It is so much more than just about this almond flour and sugar-based pastry. We started the online business that year and set up our cafe in 2014. We currently have no plans of branching out just yet, but we did open Mr. Graham's Sandwich shop this year (Hurray for the Mister!) I am currently taking a Certificate Pastry course, and I couldn't be happier! I find so much joy in the kitchen, it's crazy! I can't believe I hadn't been baking earlier, but you'll soon read about all my baking adventures! This blog is about sharing with you all the things I'm passionate about. Baked goods, music, family, travel, adventure, and arts and crafts. I aim to write about the desserts I bake and experiment with, food I love and new food I discover, chefs and bakers I admire, music I listen to, shows I've performed at, shows I've seen and want to see. It will include my past travels, future travels, DIY projects, recipes, and songs I love. I want to share with you everything that excites my being, and hopefully it will inspire other people to live their passions and dreams as well. I'm still in the learning stages of everything too; so if I write, it's not because I feel that I'm on top of all things. I'm really not. But I feel excited about being able to share my journey with you, and I hope to get your insights about my thoughts and experiences as well. Mom. Wife. 1/3 of Baihana. Head baker/Owner of Mrs. Graham's Macaron Cafe. Pastry chef someday!